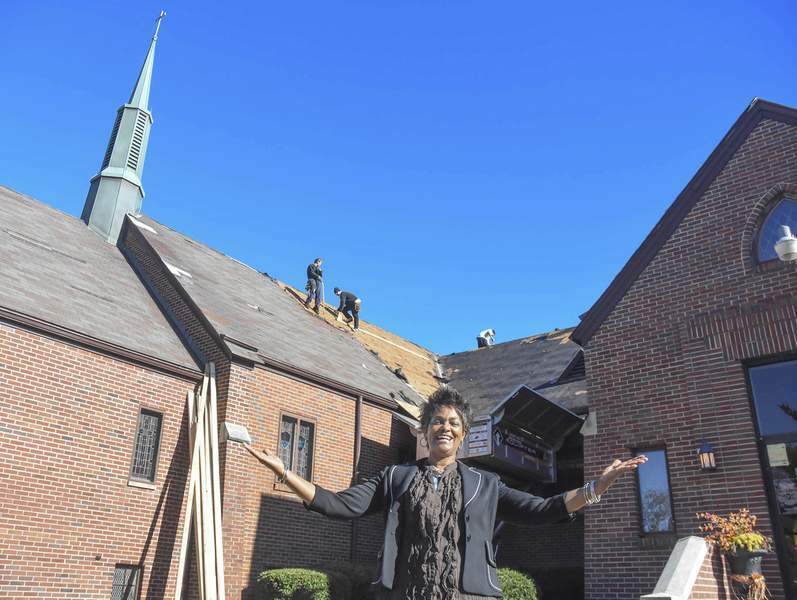 Michelle Davies | The Journal Gazette Senior Pastor Karen Staton of Destiny Life Center Church, is beyond thrilled that a new roof is going up on her congregation’s building. Things are looking up at Destiny Life Center Church as a local roofer and his crew started a three-day job Thursday to replace the roof. Since March, Pastor Karen Staton has worried over an insurance letter stating that the church wouldn’t be insured because of the roof’s condition if it wasn’t fixed in a year. Staton and her small congregation, including Assistant Pastor Patti Jae Jimerson, were able to raise the $30,000 needed in six weeks with help from a GoFundMe account and several large local donations. "I am amazed, Staton said. "I’m inspired, and I am grateful for the people of Fort Wayne and surrounding area who just poured into our cause. It was just awesome." Thursday night, Staton, Jimerson and the congregation celebrated with an extra special service, the last Thirsty Thursday for the year, Staton said, where outside pastors deliver a message to anyone who enters the church on Warsaw Street. Thursday afternoon she was at the Community Harvest Food Bank, a church partner, picking up trimmings for some of the families who will receive Thanksgiving turkeys next week, Staton said. The next phase will be repairing the damage that has been done from the leak. The good thing is the damage will be stopped when they finish doing the roof, Staton said.